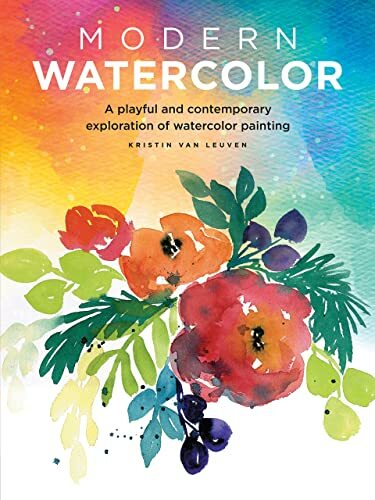 Modern Watercolor by Kristin Van Leuven is a fun guide for beginners looking to explore this exciting medium. The book has an introduction to various watercolour supplies and tools needed. That's followed by some colour theory and mixing techniques. Then there are brush techniques, and how you can use masking fluid. The rest of the book is a bit different from other watercolour instructional books that I've featured. As in, the types of subjects and styles are different from other books. There are examples that involve drawing shapes and creating letters. The examples on botanical art such as drawing flowers and leaves are based more on a stylistic approach rather than drawing from reference. This may be more suitable for beginners who are intimidated by having to follow very closely and mimicking the authors work. The exercises are clear and concise, easy to follow along. This is a good book for anyone who wants to have fun with watercolour, who want some casual exercises to work on in order to explore the medium. For those who want a more realistic approach to painting still life, landscapes or scenes, this is not the book for you. It's a quick start guide to watercolour but lacks the depth of information in some cases. If you can pick one book for beginners comparing this book with Everyday Watercolor by Jenna Railey, which would you pick? I've not seen her other book before so I can't say much. You can check out the reviews on Amazon. If you're a beginner and want to learn from the basics, check out Watercolour for the Absolute Beginner.